We create a salon experience at no cost to your facility! 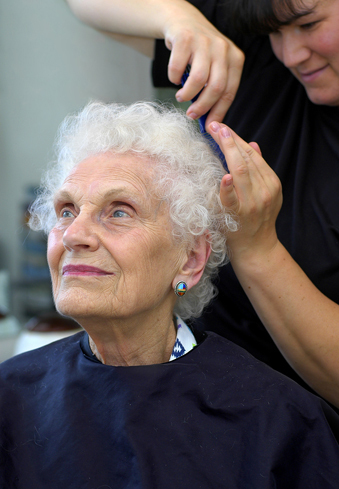 Senior Salon Services was established in response to the need of senior living communities and their residents for caring, committed and personalized care services. Amy Munro, owner and operator, worked in the nursing home industry and specifically recognized the need for QUALITY HAIR CARE FOR SENIORS in their communities. We started out with just a handful of senior living homes in New Jersey. Over the years, we have grown and extended our services to 150 communities in 12 states! Senior Salon Services provides complete salon management in senior living communities including nursing homes, assisted living homes, independent communities and all continuing care residential communities. We offer complete hands-on salon management, staffing, supplies, stylist training, liability insurance, MSDS for all products on site, bedside services, and affordable prices. Last but not least, we offer convenient scheduling and efficient, timely billing. We hire only licensed professionals to work for your residents. Our qualified stylists and barbers are experienced to accommodate the unique needs of their clients, work with all types of hair and provide an extensive range of beauty hair care services. Our stylists go through a training process where they learn about patient rights, elder abuse and neglect, HIPAA, infection control and hand hygiene. Our managers work with our stylists in each senior living community to familiarize them with the facility’s salon operations.